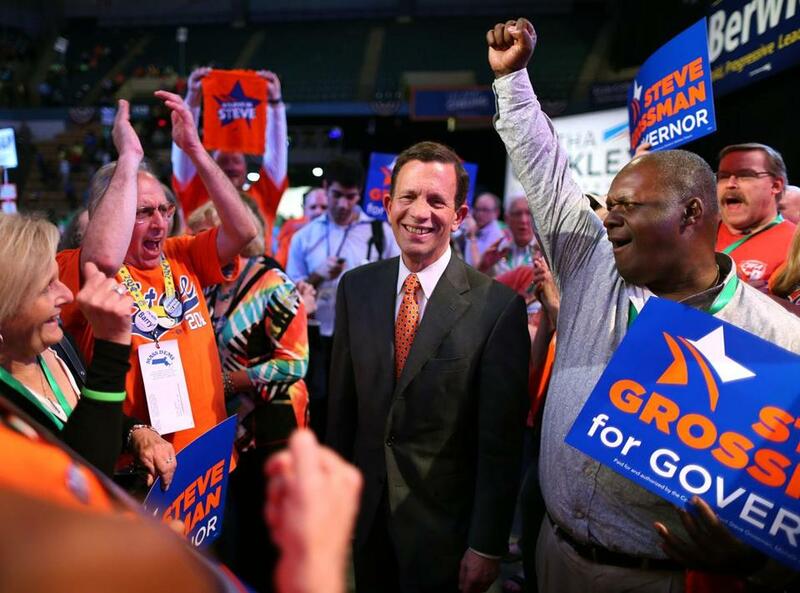 Gubernatorial candidate Steven Grossman received 35.2 percent of the vote. WORCESTER — Democratic candidates for governor Treasurer Steven Grossman, Attorney General Martha Coakley, and former Medicare chief Donald M. Berwick qualified for the Sept. 9 primary ballot, party chairman Thomas M. McGee announced this evening at the state party convention. Juliette Kayyem, a former homeland security official, and biopharmaceutical executive Joseph Avellone, did not get the 15 percent of delegate votes needed to qualify, McGee told a dwindling crowd at the party’s confab at the DCU Center just before 7 p.m.
Grossman received 35.2 percent of the vote, Coakley took 23.3 percent, Berwick got 22.1 percent, narrowly missing a second place finish. Kayyem pulled in 12.1 percent and Avellone came up last, with 7.0 percent, said McGee, a state senator. Three of the four candidates for lieutenant governor made the cut, McGee said. They are: Steve Kerrigan, a former top aide to the late Senator Edward M. Kennedy and a longtime Democratic operative; Mike Lake, chief executive of an urban policy group; and Cambridge City Councilor Leland Cheung. In the race for Attorney General, former state senator Warren Tolman pulled 51.8 percent, receiving the endorsement of the party. His opponent, former assistant attorney general Maura Healey, got 48.1 percent. And all three Democratic candidates for treasurer made the ballot: former Brookline selectwoman Deborah Goldberg, state Senator Barry Finegold of Andover, and state Representative Tom Conroy of Wayland. The party did not endorse candidates in the races for lieutenant governor or treasurer, after the top two finishers in each contest agreed not to go to a second, endorsement-focused round of voting. 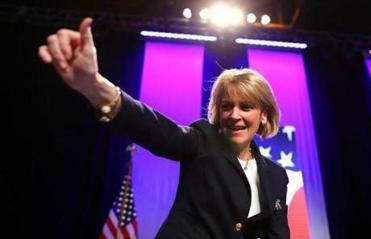 Coakley withdrew her name from the second round of voting, McGee said, meaning that Grossman received the endorsement of the party by acclamation. Not long before 6 p.m., Kayyem and Avellone both had conceded they had not met the threshold necessary to appear on the ballot. In his own statement, Avellone said he was grateful for the opportunity to have made it this far, despite coming up short. “Though I did not make the ballot, our message of ensuring a voice for all in Massachusetts was heard loud and clear,” he said. The announcement of results followed a lengthy vote-counting process and speeches from hopefuls. Coakley spoke directly to lingering doubts about her ability to win a general election, following her 2010 US Senate loss to Republican Scott Brown. She said she knew that election was painful for many of the people in the arena. But, Coakley told the crowd, she had “made the decision to get back in the ring” and assured them that, in her bid for governor, she would work harder than anyone else. “There is no one who is going to travel more miles, knock on more doors, shake more hands or make more phone calls than me in this race,” she said. He also worked to underline his progressive bona fides, speaking in favor of driver’s licenses for “all our immigrants” and transgender rights. Berwick, a one-time pediatrician and a former Medicare chief who has worked to position himself to the left of his competitors, began his speech with the story of a young man whom he helped cure of leukemia, but who was overtaken by poverty and social ills. Candidates for lieutenant governor, state treasurer and attorney general spoke earlier at the DCU Center. In the few minutes they had for their presentations, the candidates offered short videos projected on arena widescreens, gave quick versions of their biographies and offered a distillation of their policy priorities. The crowd gave the biggest cheers to the candidates for attorney general. Healey, who was introduced by former US Senator William “Mo” Cowan, spoke about her devotion to civil rights and emphasized her opposition to casino gambling. “Look at the issue of casinos. We need repeal and I am supporting repeal,” she said, underlining a difference with her opponent. Tolman, who began his presentation with a humorous video that got big laughs from the crowd, gave, perhaps, the most fiery speech of the afternoon. He emphasized his efforts as a legislator fighting against “Big Tobacco” and his opposition to the National Rifle Association. “Make no mistake: when I’m attorney general, life for the NRA just got a lot tougher,” Tolman said to applause. Recent public polling has found Tolman and Healey locked in a tight race. The crowd gave a warm but less hearty reception to the three candidates for treasurer. All began their presentations with videos that emphasized personal aspects of their stories — Goldberg’s adoption of her children; Finegold’s hardscrabble youth; Conroy’s four daughters. In speeches, they tended to speak in broad generalities, rather than diving into the specifics of a decidedly wonkish job. Before the gubernatorial candidates took the stage, the four Democrats hoping to be the party’s nominee for lieutenant governor gave presentations to the crowd. Kerrigan also knocked Republican gubernatorial hopeful Charlie Baker, calling him “Mitt Romney redux,” referring to the former governor and GOP presidential nominee. Akilah Johnson of the Globe staff contributed to this report. Joshua Miller can be reached at joshua.miller@globe.com. Follow him on Twitter @jm_bos.